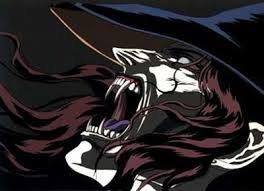 I’ve always found Vampire Hunter D to be a relaxing experience. Don’t know if it’s the soundtrack, the dark tones or the voice acting of the cast, but each and every time I watch it, I find myself strangely at ease. Quite possibly, it has to do with a theme I’ve followed over the years: the connection of the body and the mind. 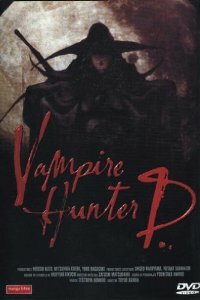 Curiously, Vampire Hunter D manages to not only work to drive a wedge in between the body and the mind, but to unify them as something inextricable through the character of D’s Left Hand. The Left Hand of D just sounds wrong. Before we get to D’s Left Hand, we first need to address how D conducts himself. D is a man of few words, who chooses a calm, cool, collected persona in order to get through daily life. The necessity for this behavior is due in part to the rejection he faces as a dhampir: as the half-human, half-vampire offspring, he represents something that doesn’t quite belong in either world. His unnatural beauty marks him as different from the humans, and his supernatural ability far surpasses that of the vampires and monsters, as he easily overpowers and outwits them. He has the potential to be a unifying factor – his very existence speaks to the convergence of two opposing worlds. With his beauty, strength and endurance, D could be argued as a representation of the great good that can be born of the union between two warring factions. From the physical perfection to the heightened abilities to his sense of moral justice, D is the perfect marriage of humanity and the supernatural. However, D rejects this union just as soundly as the human beings reject him. Hell, even the supernatural beings view him as a threat due to his immortal tenacity. As such, D turns to vampire hunting, which can be construed as a self-loathing practice on his behalf. It says quite a bit that this beautiful, talented being remains silent to avoid rejection by humans while killing the supernatural beings that are the root of his rejection in that world. Enter D’s Left Hand, who serves as the antagonist. D’s Left Hand doesn’t have a name, but he functions as the personification of the harsh mental truths that D does not wish to address or even accept, making him into a character that is both connected and divided. D’s Left Hand is an entire personality all his own (I’m going to call him Lefty from now on): more talkative, joking with a gallows humor that appeals to the audience far more than to D. Lefty points out his attraction to Doris, which D refuses to act upon out of fear that he will harm her. 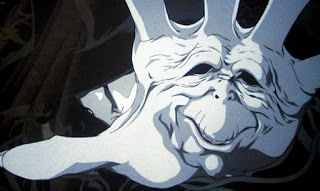 However, D receives a needling treatment from his appendage that points more so at his inner nature and neuroses: “Your behavior to say the least has been a bit odd of late. Protecting a girl you hardly know. Having man to man talks with her little brother? You’re not in love with her, are you?… Ah yes, I forgot, she did offer herself to you, didn’t she? But all you’re interested in is killing vampires. Killing, bloodshed, destruction – that’s your destiny. You may envy human emotions and yearn to share the warmth of another’s heart, but you think it’s impossible for a man like you to fall in love.” This is delivered with a taunting tone, as though goading him into action. In a sense, Lefty is testing D: if D takes the bait, he has a chance at a happier life, with the ability to give in to his own desires serving as a test to achieve a sense of happiness. D doesn’t buy it, though, and the impact is felt by the observer with what’s unsaid: D struggles with his own physical nature, and thus denies himself the mental benefits of feelings and relationships. Lefty feels the need to remind him of this, attempting, in essence, to get D to face his inner demons. “No matter how you may deny it, you’ll always show your fangs in the end,” Lefty tells him after the battle with The Three Sisters. “It’s in your blood, I recall.” Lefty thus represents the grim, undeniable truth: try as he might, D will have to answer to that part of him that beckons for something else while the rest of him denies the response. So while the D and Lefty are on opposite ends of the physical, personality, and mental spectra, they create a symbiosis in order to survive. D represents the restraint necessary to live a life of rejection: he’s quiet, he’s old, and he does not need to engage in a relationship because he has a job to do for the sake of the greater moral good. Lefty, on the other hand (see what I did there? ), feels the need to continually point out the ruth, even if it makes D uncomfortable. This places the two in complete opposition to each other: one wishes to forget and forge on in the physical world, while the other remains predominantly hidden from the world while effectively terrorizing the mental blocks that his other half has erected. What unifies them is their dependency upon each other: they need each other to survive in more ways than one. D needs Lefty to survive the fatal fight against Rei, and Lefty needs D because otherwise, he’s just a disembodied hand. In the face of a mist monster after a stake attack, Lefty manages to use his abilities to defeat the threat and reattach himself in order to keep D alive. “What would you do without me?” Lefty asks, then quickly adds, “Don’t answer that.” D, however, needs this company from Lefty, despite that Lefty wants to broach subjects D does not wish to address. Lefty’s points force D to fight even harder against his nature, which allows him to continue being the hero that everyone needs. One needs the other, and vice versa. During one particular conversation between the pair, Lefty poses a point on the inevitability of fighting one’s nature: “Why do you refuse to accept what you are? It’s pointless, you know.” D responds in kind: “I warn you, another word and I’ll slice you off.” Rather than continue to goad, Lefty lets it go, for he knows that he’ll have plenty of opportunities another day. After all, they need each other. And with the fact that they’re immortal, they’re going to need each other for a while, much as we need our own bodies and minds to connect in order to function as a cohesive unit.